The record is made up of 1 file (4 folios). It was created in Feb 1936-5 Feb 1937. It was written in English. The original is part of the British Library: India Office The department of the British Government to which the Government of India reported between 1858 and 1947. The successor to the Court of Directors. Records and Private Papers. Oil Co., Ltd., dated 17th May 1935.
whenever it is required by the contract, include its assigns), on the other part. any manner he considers to be consistent to his interests. line drawn on the map attached to this Agreement. connection from time to time. inspection by the Shaikh or his authorised representative. 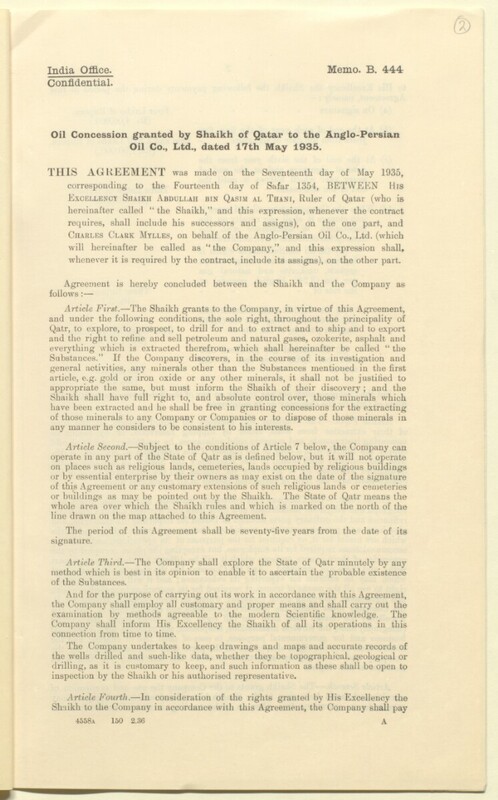 The memorandum contains a printed copy (folios 2-4) of the oil concession agreed between the Shaikh of Qatar, Abdullah bin Qasim al Thani [‘Abdullāh bin Jāsim Āl Thānī], and Charles C Mylles, Representative of the Anglo-Persian Oil Company (APOC), on 17 May 1935. Following the concession agreement are copies of three letters (folio 5) sent by Mylles to Shaikh ‘Abdullāh, all dated 17 May 1935, relating to the signing of the concession agreement. The memorandum is part of a larger file, the first folio of which (f 1) is a contents page. The first two items listed on the contents page are covered by memorandum number B 444. Foliation: The foliation for this description commences at f 2 and terminates at f 5, as it is part of a larger physical file; these numbers are written in pencil, are circled, and are located in the top right corner of the recto The front of a sheet of paper or leaf, often abbreviated to 'r'. side of each folio. The main foliation sequence commences at the front cover, and terminates at the back cover; these numbers are written in pencil, are circled, and are located in the top right corner of the recto The front of a sheet of paper or leaf, often abbreviated to 'r'. side of each folio.